A 2006 article by The New York Times declared, “At Ole Miss, the Tailgaters Never Lose.” And, more than 10 years later, the headline still rings true. A search for the “best tailgating in U.S. college football” most often returns Ole Miss at the top of the rankings. That’s because, every game, fans don their finest clothes and bring their ‘Hotty Toddy’ spirit to The Grove, a 10-acre tailgating paradise, where even the restrooms are classy at a price of $71,000 each. It’s the unique experience found in The Grove that draws more than 100,000 people to games. This is 35,000+ more than Ole Miss’s Vaught-Hemingway Stadium seats. A turnout like this makes it no surprise the Wendy’s College Tailgate Tour made Ole Miss one of its stops in 2017. The tailgate tour, led by the fast food franchise known for fresh hamburgers, brought leading brands to each of its host cities. These were Coca-Cola, Nissan, Kellogg’s, and consumer electronics brand, TCL. And, all came with engaging activities to attract football fans. 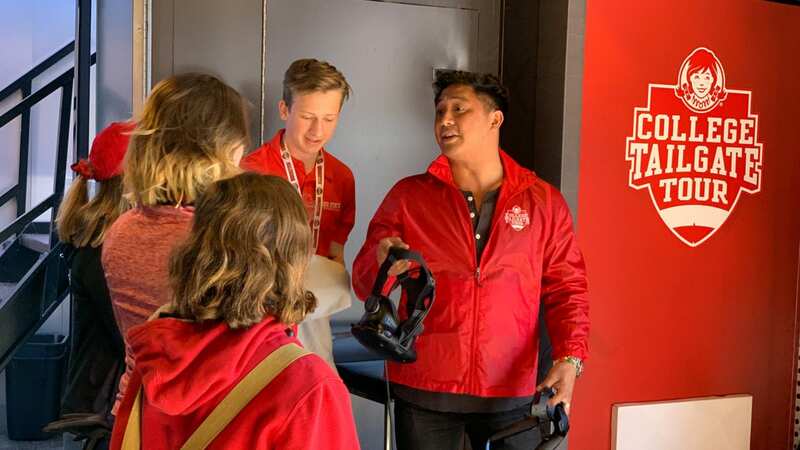 For example, from its eSports Lounge, TCL offered visitors a virtual reality experience, as well as the chance to play the Madden NFL video game using TVs that also broadcasted the day’s other sporting events. It was TCL’s experiential marketing tactics that drove nearly 1,300 people to its activation. Most important, they emblazoned the brand in game-day memories – a result which has made tailgate marketing a smart strategy. At the same time, the competition is heating up outside the ticket gates as brands seek to win at the best tailgate experience. College football isn’t the only place you’ll find a good tailgate party. From the NFL to the NHL, NASCAR, the Kentucky Derby, and more, fans take great pride in their teams and their love of the games. So much so, they are willing to arrive hours, or even days in advance in some cases, to kick off festivities. That’s because, The Washington Post reports, studies to have shown fans would rather be identified with their favorite team, more so than their work, social groups, and religion. It’s believed to be due to sports providing “points of connection for communities.” That means, contrary to the rivalrous nature of sporting events, they bring people together. This is also one of the top reasons people love experiential marketing events. In turn, brands take advantage of the medium at the tailgate to forge relationships with enthusiastic fans. And, sports teams encourage brands’ involvement to provide a better overall experience. This is while they implement their own solutions to drive more traffic. For example, Florida State University, which expected over $109 million in athletics revenue last school year, recently announced new game day events for the first football game of the season. It is also moving the Coca-Cola tailgate zone to accommodate a new VIP tailgate section. They know, at the end of the day, it’s the experience of it all that fans crave. It’s what they want to spend their money on. And, when brands can contribute to a great fan experience, it puts them on the winning team. Unfortunately, some have yet to score with tailgate marketing. Event marketers can improve tailgate marketing results when they first identify the fumble. It may be among the three below, but there are fixes. At the same time, other brands can kick off tailgate marketing efforts by being mindful to not make these common mistakes. Many event marketers will set up in their designated locations and wait for their displays or activities to draw a crowd. But, the fact is, many tailgaters will do the same. They come with their grill, food, drinks, and even their own entertainment, and won’t leave their spots until it’s time for the main event. This results in missed opportunity for brands. A better practice is to bring additional event staff, such as brand ambassadors or street team members. These professionals can get out in the crowd to engage fans at their tailgates and even bring them back to your setup, boosting your investment. Activating street teams is a great idea for large-scale events, such as the World Cup, which may find sports fans in various areas of a city. They’re also ideal in the United Kingdom, where your target audience can be found pre-gaming in pubs instead. 2. Benching your best players. The New England Patriots wouldn’t bench Tom Brady in the Super Bowl. After all, he’s won five of them. And, you shouldn’t rely on anyone less than the best for tailgate marketing either. Your “best” will be event staff who have the skills to fulfill their assigned tasks of your activation. They will also have the personalities to engage consumers, share key messages, and move relationships past the goal line. And, they’ll be passionate about the game and team at hand. It’s also a great idea to locally source talent, like alcohol brand Stillhouse did for its 13,000-mile tailgate tour. This allowed them to build a relatable home team and kept them from spending unnecessary dollars on staff travel. 3. Not playing with your best strategy. The rise of experiential marketing, especially as it applies to tailgate marketing, has left brands clamoring to stop traffic and enhance the fan experience. That means it’s no longer an option to smile and simply hand over a sample. As mentioned, event staff should be engaging consumers in strategic ways. For example, when Nissan hit the road with the Wendy’s Tailgate Tour to show off its new vehicles, it didn’t park them on the lot and wait for people to stop. Instead, the brand’s team used tactics to lure fans. These included giveaways and sweepstakes, airbrush artists, and phone charging stations – tactics that held the fans’ attention for a while and added to their game day experiences. Along these same lines, your activities shouldn’t be dated. Your brand must stay on top of experiential marketing trends to be relevant and, even better, knock fans’ socks off. That’s what French car brand, Citroen, did outside the Arsenal Football Club’s Emirates Stadium in London. It built on the game of Footpool – then, an “experiential craze” – to show off its Airbump technology that protects its cars’ bodies. To do so, it erected an “oversized pool table” that incorporated the technology “to ensure maximum bounce on the surface.” It was a brilliant idea that stopped passersby in their tracks on their way to and from the stadium to enjoy the brand’s game. At Elevate, we have the best teams and tactics to make you tailgate marketing campaign exceed expectations. Let us help your brand ensure fans pre-game harder and happier.